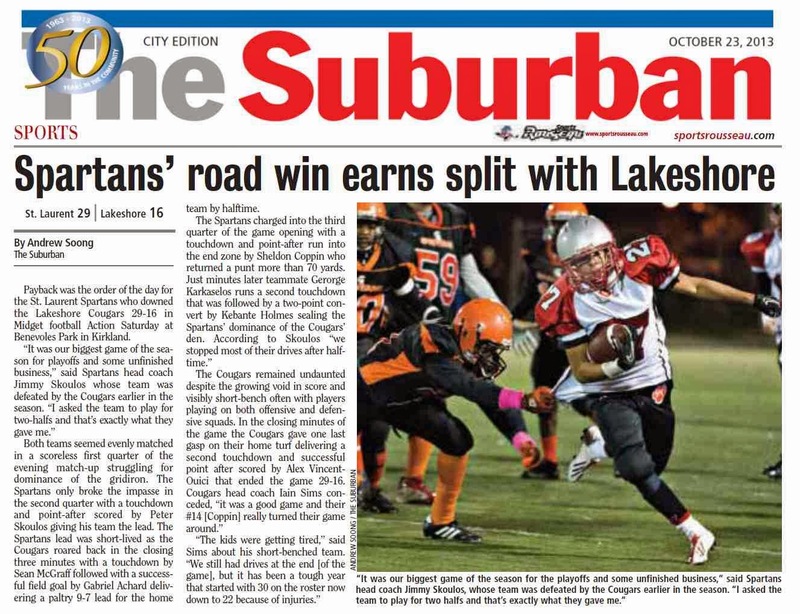 Payback was the order of the day for the St. Laurent Spartans who downed the Lakeshore Cougars 29-16 in Midget football Action Saturday at Benevoles Park in Kirkland. Both teams seemed evenly matched in a scoreless first quarter of the evening match-up struggling for dominance of the gridiron. The Spartans only broke the impasse in the second quarter with a touchdown and point-after scored by Peter Skoulos giving his team the lead. The Spartans lead was short-lived as the Cougars roared back in the closing three minutes with a touchdown by Sean McGraff followed with a successful field goal by Gabriel Achard delivering a paltry 9-7 lead for the home team by halftime.